The mother of three children to Yusuf Bey, the late founder of Your Black Muslim Bakery, is now serving as the real estate broker for someone trying to buy the bankrupt bakery’s North Oakland headquarters for $899,000. Would-be buyer Paulette Martha Arbuckle, 54, also of North Oakland, is represented by Antioch real estate broker Esperanza Nievas Johnson — also known over the years as Noor Jehan Bey and Nora Bey. Her identities were matched using Social Security numbers. An attorney for the trustee overseeing the bakery’s liquidation said there’s nothing prohibiting Johnson’s participation, but it is something he will bring to the judge’s attention. Birth certificates indicate Noor Jehan Bey had at least three children — Yusuf Bey III, 28; Nisa Jehan Bey, 27; and Amir Yusuf Bey, 25 — by the family patriarch, who died of cancer in late 2003. Records show all three have claimed the same Antioch address as Johnson at times. And property records show that as Noor Jehan Bey in 1981, she deeded property to Your Black Muslim Bakery; no value was assigned to the property because it was listed as a gift. Records also show that under the same name, she was involved in at least two property transactions also involving Farieda Bey, Yusuf Bey’s wife, who was among Bey family members in whose name the bakery headquarters has been listed. There’s no evidence of any direct connection between Arbuckle and the Bey family, although she’s a longtime resident of the neighborhood where the bakery is located.Neither Arbuckle nor Johnson could be reached for comment Friday. A working phone number for Arbuckle couldn’t be found; a note left on her home’s door didn’t yield a callback. Johnson didn’t respond to a voicemail, an e-mail or a note left on her Antioch home’s door; a Pittsburg office address listed on her real estate license is now vacant. Nyberg was surprised Thursday by news of Johnson’s identity — he said he and trustee Tevis Thompson Jr. hadn’t known of the family connection until a reporter’s call. “Insiders of a debtor corporation are not prohibited from transactions … those transactions just tend to be scrutinized a little more closely,” Nyberg said. “We’ll disclose it but at the end of the day, whether it’s her or some other broker, someone would be entitled to the commission,” he added. “We’re not even sure at this point that Arbuckle will be the successful bidder — we’re told there are other parties ready to overbid.”Thompson filed a motion Oct. 11 saying he’s preparing to sell the bakery headquarters property to Arbuckle. The motion asked Jellen to allow the sale free of liens placed by the bakery’s creditors, and scheduled a Nov. 8 hearing on the matter. “The sale is an arms-length transaction between the Trustee and Paulette Arbuckle. 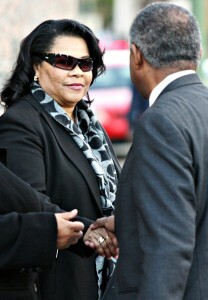 As far as the Trustee can ascertain, Paulette Arbuckle is an individual who had no prior interest in or connection with the Debtor,” the motion says. A purchase agreement between the trustee and Arbuckle — dated Sept. 10, just four days after the property went on the market, and now filed amid the court papers — lists Johnson and her brokerage, Signature One Mortgage and Realty, as Arbuckle’s broker. Nyberg said amended papers on the sale will have to be filed Monday with the court, as a title company which had prepared a report on the property omitted several liens. The original motion had set Oct. 29 as a deadline for submitting any overbids, at a minimum of $904,000; it’s unclear whether that deadline or the Nov. 8 hearing will be pushed back due to Monday’s refiling. If any overbids are submitted, they and Arbuckle will attend a live auction for the property. Feleciai Favroth, the Oakland real estate broker retained by Thompson to sell the property, was there at midday Friday to show an unidentified couple inside. The building remains largely boarded up; one upstairs window was open, others were broken, and orange health department closure notices still dot the storefront. The property — an L-shaped lot of about 14,000 square feet, on which the bakery building stands at 5832-5838 San Pablo Ave. and a residential duplex stands at 1083 59th St. — was placed in the trustee’s hands in August after a judge moved the business from voluntary Chapter 11 reorganization into Chapter 7 liquidation. The San Pablo Avenue building is a bit less than 7,000 square feet with the lower level largely open and living quarters upstairs, Favroth said in September, while the duplex is about 1,400 to 1,500 square feet. More than 200 police officers swarmed those and other properties Aug. 3. Four people were arrested including Devaughndre Broussard, a bakery handyman who has been charged with the Aug. 2 homicide of Oakland Post editor Chauncey Bailey. Police said Broussard confessed to the crime after the murder weapon was found in his closet; he and his lawyer since have said the confession was coerced and bogus. Also arrested was current Your Black Muslim Bakery CEO Yusuf Bey IV, first on a warrant connected to an assault case in San Francisco and later on charges in a May kidnapping/assault incident in Oakland. But stories of violence have dogged his family for years — a 21-year-old son gunned down in 1994, the same year that two relatives were charged with torturing a man. Bey died in 2003 while charged with 27 counts in the alleged rapes of four girls under age 14; his successor, Waajid Aliawwaad Bey, was found in a shallow grave in the Oakland Hills in 2004. Then the next CEO, Antar Bey, was gunned down in a 2005 carjacking attempt, and Yusuf Bey IV assumed the business’ helm just before being arrested for vandalizing two West Oakland liquor stores. Bankruptcy court documents say the business spun out of control during this family turmoil, leading Yusuf Bey IV to file for Chapter 11 protection late last year. But he failed to file reports and pay fees, and the judge last month ordered the business liquidated to satisfy its creditors.